The Late Effects of Polio (LEoP) can manifest 15 or more years after the initial polio infection. The LEoP can cause new muscle weakness and atrophy, chronic fatigue, pain, and respiratory problems, as well as other progressive and debilitating symptoms. This webpage has a collection of information on the LEoP. 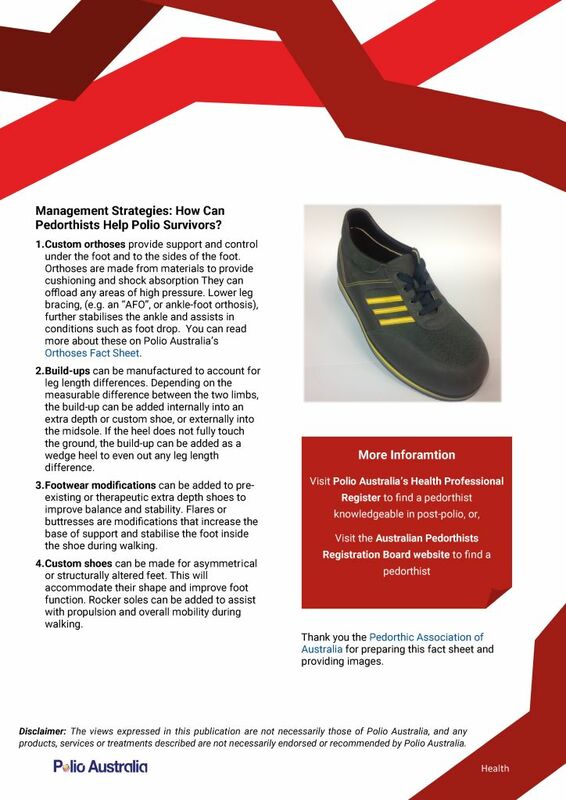 For more specific symptom-based information and fact sheets - please visit www.polioaustralia.org.au/living-with-polio. Health - LEoP - Do You Know The Signs? Polio Australia’s clinical practice resource for health professionals – “The Late Effect of Polio: Managing Muscles And Mobility” - aims to assist health professionals to more quickly recognise the symptoms of Post-Polio Syndrome (PPS) and the Late Effects of Polio (LEoP), so that clients can receive accurate diagnosis and timely, appropriate and effective care. It is a collaborative effort by Polio Australia’s Clinical Advisory Group experts and integrates personal accounts from ‘Lived Experience Experts’ – the survivors of polio themselves. Information found within includes the very latest in best-practice methods of treatment and care of clients as they age with LEoP. No questions have been asked so far. An interdisciplinary approach is recommended to help manage the Late Effects of Polio, as individuals are likely to have a wide variety of problems. Management programs are key to analysing and minimising symptoms, maximising function, and supporting participation. You can view more information about health professionals who may be able to help you on this page. Visit Polio Australia's Health Professional Register to find an appropriate health professional.